“An Art form we have been evolving for decades,” Rob Speyer, Tishman Speyer’s Chief Executive remarked when considering how Tishman Speyer continues to uncover value at its assets. Keiko Morris at The Wall Street Journal recently wrote about 2 midtown projects. The first at 200 Park Ave, Tishman Speyer was able to leverage new technology and move machine rooms to develop a spectacular, 24,000 square foot penthouse on the 58th floor. The second project currently in development on the 43rd floor of 520 Madison Ave will more than double the 7,100 square-foot space once dedicated to mechanical equipment and build a 21,000 square-foot penthouse with a 2,200 square-foot terrace and views of Central Park. “Typically, the penthouse additions feature high ceilings, tons of light through glass facades or large windows and connecting outdoor space. Landlords often have to be creative in finding the space to build these structures, sometimes moving mechanical equipment to another part of the building, tapping undeveloped space or transferring air rights from adjacent lots”, said real-estate lawyer Jonathan Mechanic in the Wall Street Journal article published on April 16th, 2017. These renovations are never simple, considering their logistical scope, and without disrupting the tenants in the building, however finding and creating these types of opportunities are part of the fabric of the Tishman Speyer culture. “We’re always looking around the corner and pursuing ways to unlock additional value,” Rob Speyer told the Wall Street Journal. The penthouse at 200 Park Avenue was quickly leased and it is anticipated that the 520 Madison Avenue penthouse with a terrace will draw significant interest as well. “These office penthouse additions are part of a broader push by owners to carve out more dynamic amenity spaces to appeal to tenants looking to embellish their brands and recruit top employees”, said Brian Waterman, vice chairman at real-estate-services firm Newmark Grubb Knight Frank in the Wall Street Journal article. Of the 200 Park Avenue Penthouse, “You feel like you can reach out and grab the spire of the Chrysler Building,” said Tishman Chief Executive Rob Speyer. This is certainly a unique amenity and has an appeal that is unparalleled. In a speech at the Urban Land Institute’s 2016 Asia Pacific Summit in Shanghai, Rob Speyer discussed the important connection between transportation and real estate in cities across the world. With an enormous number of people expected to move to cities in the future, mayors are in a unique position to craft smart, sustainable transportation policies – and Speyer noted that connectivity is key. Speyer explained how real estate and transportation are becoming more connected every day and commended the mayors of Shanghai, Los Angeles and Rio de Janeiro for their foresight on these issues. Rob Speyer recently discussed the significance of worldwide collaboration among mayors around the globe at the Urban Land Institute’s recent 2016 Asia Pacific Summit, which took place in Shanghai, China. Speyer highlighted the importance of mayors to actively engage colleagues from throughout the world to improve their respective cities, noting the connections made between the mayors of Los Angeles, Rio de Janeiro and Shanghai when talking about developing cities of the future. Speyer called on city mayors to start addressing their excessive traffic and pollution issues before it’s too late. Rob Speyer announced today that Tishman Speyer is moving ahead with construction of its 1.1 million square foot office and retail project in Long Island City. Construction of the new project, which includes two 27-story towers designed by Raul De Armas of MdeAS Architects, will begin in early 2017 with completion anticipated in 2019. The towers will be connected by a four-story podium and will include a mix of retail, complemented by a food hall, restaurant and parking garage — providing numerous amenities to local workers and residents in the vibrant mixed-use neighborhood. “Thanks to the City of New York’s investment in the area’s infrastructure, enlightened policy decisions and the active support of the New York City Economic Development Corporation, the local community and its elected officials, Long Island City has become a model for 21st Century urban development,” Speyer said. Tishman Speyer is now the largest developer of both commercial and residential space in Long Island City, being responsible for 3.5 million square feet of development in Long Island City since 2003. In February, Tishman Speyer announced plans for a 65-story building in the heart of Manhattan’s West Side. Bjarke Ingles, designer of The Spiral, provides an in-depth look at the building that sits a block away from the north end of Manhattan’s High Line Park. Earlier this month, Tishman Speyer released its third Global Sustainability report. Tishman Speyer was awarded a 2015 ENERGY STAR partner of the year award, which honors companies that demonstrate the best energy saving practices across the industry. In addition, Tishman Speyer hit a number of company landmarks in 2015, including: First LEED Gold for Existing Building in NY (357 Hudson St.), first building to achieve LEED Gold in South America (Rochavera Corporate Towers, Brazil), and first tower to achieve LEED Platinum in Frankfurt (Taunusturm, Germany). “At Tishman Speyer, we believe that sustainability in the built environment is increasingly critical to our future,” said CEO Rob Speyer in the report. “The result of this belief has been our commitment to delivering beautiful, healthy and efficient buildings since our inception.” Numerous Tishman Speyer buildings have made a positive impact on the environment, improving efficiency and meeting the unique challenges of the urban landscape. “Whether constructing new buildings or redeveloping existing ones, we strive to do so in a way that minimizes impact on the environment at every stage of the building life cycle, while maximizing sustainable value,” said Speyer. Tishman Speyer, a leading global real estate developer and investor, has announced the closing of the first RMB Fund by a foreign developer. The firm raised 1.2 billion RMB solely from Chinese investors and will invest it in the development of a prime site in Suzhou. The project will consist of two towers totaling 114,300 square meters (1.23 million square feet), featuring both commercial office and retail space along with luxury residences. Hwabao Trust, a leading trust company in China, is a cornerstone LP investor in the fund. Noah Holdings Limited (NYSE: NOAH) serves as the fund’s exclusive financial advisor. The project site is located in the Suzhou Industrial Park (“SIP”), in Suzhou’s central business district on the west bank of Golden Rooster Lake. It consists of two parcels straddling Suhua Road that will have direct access to a major subway line that began operation earlier this week. The buildings will be constructed according to LEED Gold criteria and the office space will be marketed primarily to prominent multinational and domestic companies, as Tishman Speyer has done successfully in its developments throughout the world. Brazil is developing so fast. “Brazil is developing so fast the existing stock is only now starting to meet the quality level that multi-national companies need and expect,” said Rob Speyer, president and co-chief executive of Tishman Speyer. Joint venture partners Tishman Speyer and Commerz Real AG laid the foundation stone for the “TaunusTurm” office tower, which will be the latest addition to Frankfurt skyline. Located in the heart of Frankfurt’s banking district, the 40-story, 650,000 square-foot (60,000-square-meter) tower is scheduled to be delivered by the end of 2013. 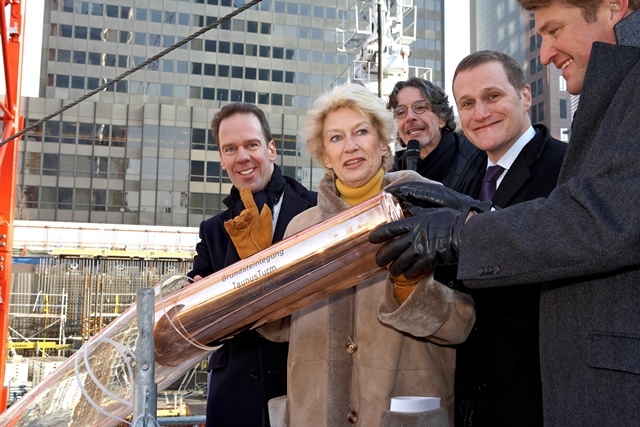 In the presence of 350 invited guests, Petra Roth, Mayor of the City of Frankfurt, and architect Martin Gruber joined Jerry and Rob Speyer, Co-CEOs of Tishman Speyer, as well as Jochen Klösges, a member of the Commerzbank AG Board of Managing Directors, in lowering the copper foundation stone capsule through a Plexiglas tube into the 10-meter-deep construction pit. For Tishman Speyer, TaunusTurm represents the third phase of what has proven to be an enormously successful development initiative in Frankfurt, preceded by the MesseTurm and OpernTurm projects. To be located at the corner of Neue Mainzer Strasse/Taunustor and the “Wallanlagen”, the park belt, TaunusTurm will be the first building on Neue Mainzer Strasse to have its 13-meter-high entrance facing the adjacent park. The slender tower with a white natural stone façade, which was designed by the Frankfurt firm Gruber + Kleine-Kraneburg Architekten, is expected to be the first new high-rise in the city to be awarded LEED Platinum certification. The construction of TaunusTurm will considerably upgrade the Wallanlagen – the adjacent former city fortifications. Part of the plot of land will be used to extend them and make them accessible by means of a new promenade along the entire row of buildings. Amenities in the form of a restaurant for staff and guests, and a business club with conference space will enhance the property. Next to the TaunusTurm, Tishman Speyer is developing a residential tower, with an entrance aligned to the park, making it a prime address on Frankfurt’s unique park belt. “Be Inspired – by seeing what is! We as architects are constantly moved forward by our visions. Creating a new location, imagining it from nothing, now that is always the search for the special, for the essentials. At this location, right here, we see the great opportunity to design and build a sculptural high-rise, a shape that contained multiple uses, right in the heart of the city of Frankfurt. TaunusTurm brings all this together and can be read as a metaphor for contemporary economics and aesthetics,” commented Martin Gruber of Gruber + Kleine-Kraneburg Architekten.